Arms: Vert, a horse courant Argent, crined, unguled and bridled Or; on a chief Or, a book expanded Argent, garnished proper. Crest: A wreath Or and Vert, and thereupon is set for crest, a lion's head erased Or, langued Gules. The book represents the armigers career as a teacher and elementary school principal. The horse represents the equestrian interest and background of the armiger. 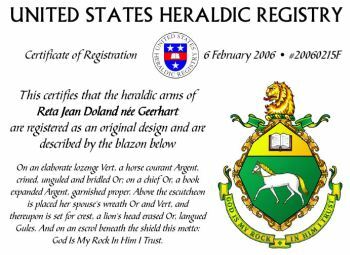 The blazon is also representative of Irish and German roots of the armiger.